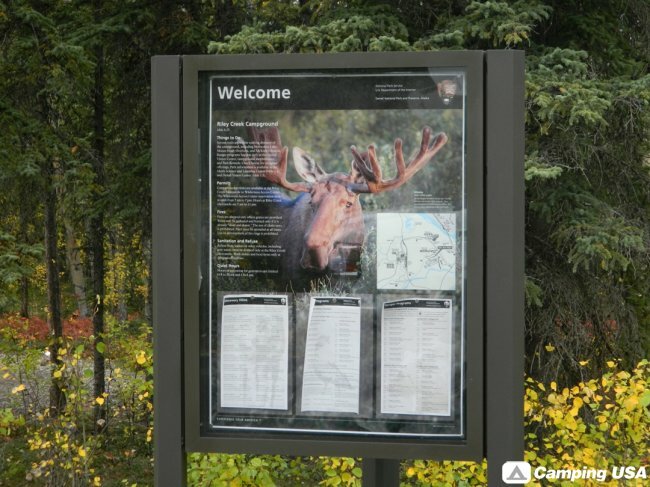 Riley Creek Campground is located just inside the park entrance. 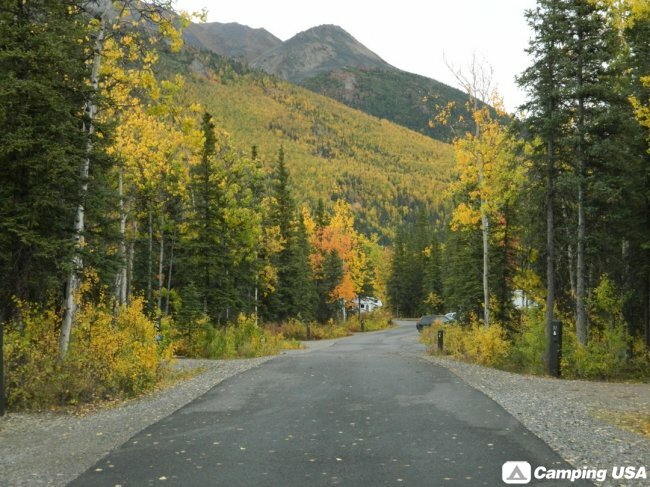 It is the largest campground in Denali, with sites that can accommodate tents or RVs, up to 40′ in length. A small section in the third loop (the lowest loop in the image above) is designated as walk-in, tent-only camping. 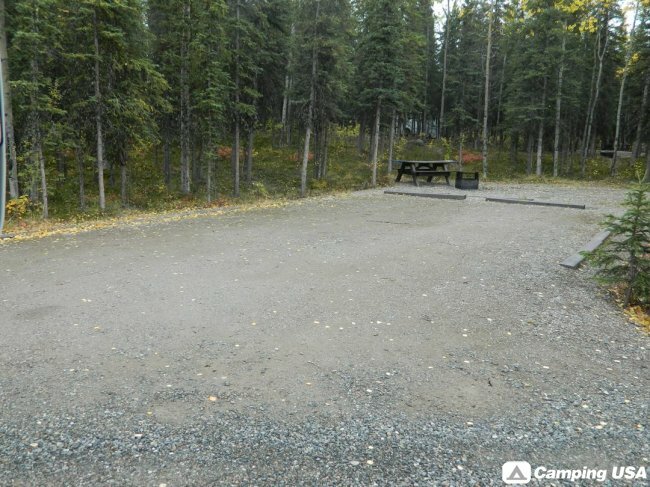 “Walk-in” means both no vehicles in this part of the campground, and that these sites can only be booked upon arriving in the park, not in advance. 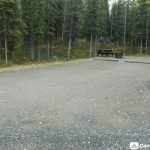 No campground in Denali has electrical or water hookups for RVs. However, Riley Creek has a nearby mercantile, or general store, which features camping supplies, food, a shower house and laundry facilities. The mercantile also has a dump / fill station for RV use. Riley Creek is a fairly wooded campground, with some screening between sites whenever possible. 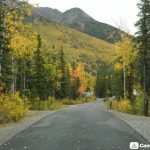 The proximity of Highway 3 means there is occasional traffic noise, but also means campers have all the conveniences and amenities of the park entrance area, and businesses outside the park, close at hand. Trails leading from the campground connect to the Denali Visitor Center, which is the central hub of trails in the entrance area. Small animals, such as red squirrels and snowshoe hare, are commonly seen in Riley. 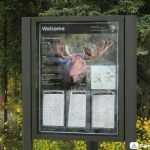 Large animals, like moose, occasionally appear in the campground. Bear sightings in Riley are more rare, but do happen. Read below for wildlife safety information. There is a maximum of eight people and 1 vehicle / RV per site. Necessities. Restrooms, both flush-toilet and pit-vault, can be found throughout the campground. Potable water is available both at the mercantile and at spigots throughout the campground. All sites have a picnic table and fire grates (see below). Wildlife & food storage. Keep all food and scented items (e.g., toothpaste, sunscreen, ice chests/coolers, etc) in your hard-sided vehicle if available. If you are tent-camping without a vehicle, use the food lockers found throughout the campground. Label and date your items in the food locker. Keep a clean camp and wash your dishes immediately. Fire. Fires are allowed only in established grates. Wood may be purchased at the mercantile. Use of power saws, and the cutting of live vegetation or standing deadwood, are prohibited. Do not leave your campfire unattended. Do not cook directly on fire grates – use foil, and immediately dispose of it after cooking. Pets. Pets are welcome at Riley. Dispose of pet feces in garbage cans. Secure pet food in your vehicle or a food locker.